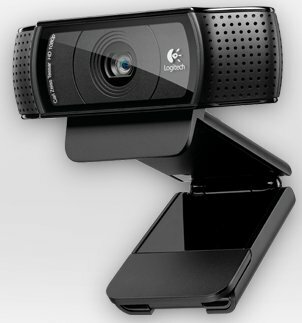 Logitech introduced the HD Pro Webcam C920, a new webcam with 1080p HD support. Logitech (SIX: LOGN) (NASDAQ: LOGI) today unveiled the Logitech® HD Pro Webcam C920, making it easier than ever to capture full-HD 1080p video that’s faster and smoother and performs well on more computers. The device offers breathtaking quality, allowing friends and loved ones to see and hear the real you. The Logitech HD Pro Webcam C920 captures full-HD 1080p video for connecting with friends using Skype™ or in HD 720p for Windows Live™ Messenger. Thanks to H.264 advanced compression technology, you can upload full-HD 1080p video clips or 15MP photos quickly and with one click to Facebook, Twitter™ or YouTube™ (account required). To enjoy 1080p HD video calling you’ll need to download the latest version of Skype, Skype 5.7 Beta for Windows. Logitech Fluid Crystal™ Technology is what sets a Logitech webcam apart. In addition to smoother video motion without annoying choppiness, you get sharper pictures, richer colors and clearer sound – so your loved ones will literally see and hear more of you – even if you don’t have the newest computer on the market. The Logitech HD Pro Webcam C920 also features Carl Zeiss optics and a premium 20-step autofocus, Logitech’s smoothest, most responsive autofocus yet. And because being heard is just as important as being seen, two mics positioned on either side of the webcam capture natural stereo audio.